Chalcone or (E)-1,3-diphenyl-2-propene-1-one scaffold has gained considerable scientific interest in medicinal chemistry owing to its simple chemistry, ease in synthesizing a variety of derivatives and exhibiting a broad range of promising pharmacological activities by modulating several molecular targets. A number of natural and (semi-) synthetic chalcone derivatives have demonstrated admirable anti-inflammatory activity due to their inhibitory potential against various therapeutic targets like Cyclooxygenase (COX), Lipooxygenase (LOX), Interleukins (IL), Prostaglandins (PGs), Nitric Oxide Synthase (NOS), Leukotriene D4 (LTD4), Nuclear Factor-κB (NF- κB), Intracellular Cell Adhesion Molecule-1 (ICAM-1), Vascular Cell Adhesion Molecule-1 (VCAM-1), Monocyte Chemoattractant Protein-1 (MCP-1) and TLR4/MD-2, etc. The chalcone scaffold with hydroxyl, methoxyl, carboxyl, prenyl group and/or heterocyclic ring substitution like thiophene/furan/indole showed promising anti-inflammatory activity. 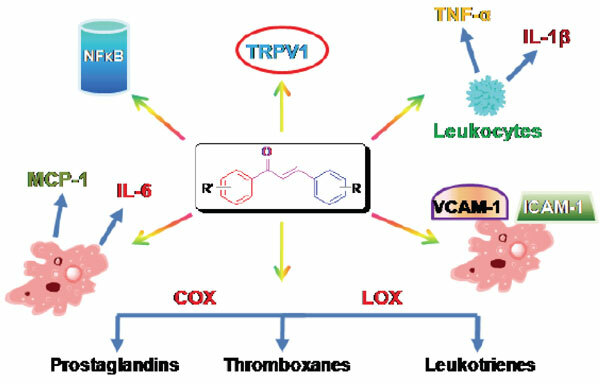 In this review, a comprehensive study (from the year 1991 to 2016) on multi-targets of inflammatory interest, related inflammation reactions and their treatment by chalcone-based inhibitors acting on various molecular targets entailed in inflammation, Structure-Activity Relationships (SARs), Mechanism of Actions (MOAs), and patents are highlighted. Keywords: Chalcone, inflammatory, inhibitor, patent, pathway, target. Keywords:Chalcone, inflammatory, inhibitor, patent, pathway, target. Abstract:Chalcone or (E)-1,3-diphenyl-2-propene-1-one scaffold has gained considerable scientific interest in medicinal chemistry owing to its simple chemistry, ease in synthesizing a variety of derivatives and exhibiting a broad range of promising pharmacological activities by modulating several molecular targets. A number of natural and (semi-) synthetic chalcone derivatives have demonstrated admirable anti-inflammatory activity due to their inhibitory potential against various therapeutic targets like Cyclooxygenase (COX), Lipooxygenase (LOX), Interleukins (IL), Prostaglandins (PGs), Nitric Oxide Synthase (NOS), Leukotriene D4 (LTD4), Nuclear Factor-κB (NF- κB), Intracellular Cell Adhesion Molecule-1 (ICAM-1), Vascular Cell Adhesion Molecule-1 (VCAM-1), Monocyte Chemoattractant Protein-1 (MCP-1) and TLR4/MD-2, etc. The chalcone scaffold with hydroxyl, methoxyl, carboxyl, prenyl group and/or heterocyclic ring substitution like thiophene/furan/indole showed promising anti-inflammatory activity. In this review, a comprehensive study (from the year 1991 to 2016) on multi-targets of inflammatory interest, related inflammation reactions and their treatment by chalcone-based inhibitors acting on various molecular targets entailed in inflammation, Structure-Activity Relationships (SARs), Mechanism of Actions (MOAs), and patents are highlighted. Dendritic Cells: More Than Just Adaptive Immunity Inducers?